Under-Communication Hinders Just-Right Enforcement – Erik Kondo – Conflict Research Group, Intl. 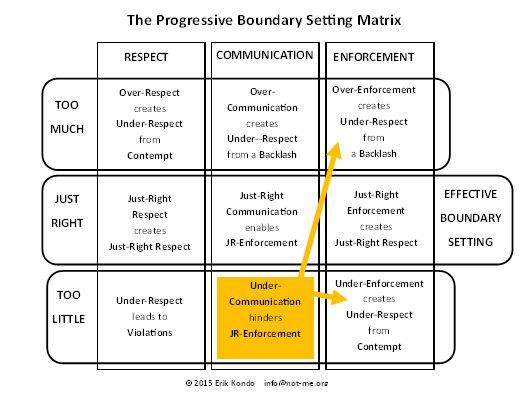 The purpose of communication is to aid enforcement by conveying the rules of behavior (boundaries). Without clear communication appropriate (Just-Right) enforcement is difficult to achieve. Silence, Beat around the bush, Imply, Misinform, Mislead. Some people violate the rules unintentially because they don’t understand the rules of behavior. Other people violate the rules intentionally because they have no respect for the rules of behavior. If both these violations are handled similarly, it will result in preceptions of Over-Enforcement for unintential violations and Under-Enforcement for intential violations. If a person who has committed an unintential violation is punished to the same degree as someone who has committed an intentional violation, it is likely that the Beholder(s) will feel it is Over-Enforcement. If a person who has committed an intential violaton is punished to the same degree as someone who has committed an unintential violation, it is likely that the Beholder(s) will feel it is Under-Enforcement. Both of these situations will lead to less Respect for the rules of behavior. When individuals don’t effectively define the rules of acceptable behavior, they are depending on other people to “know” the rules and also to respect those rules. Inevitably, some people will violate the rules. When a boundary was not clearly conveyed, the violated person doesn’t really know whether the violation was intential or unintentional. As a result, he or she will have difficulting determing the appropriate level of enforcement. Under-Communication creates gray areas, whereas clear communication creates well defined boundaries. Effective communiction removes doubt that a violation was unintentional. Under-Communication on the other hand, leads to uncertaincy. The Violator may not have understood the rules, and the Violated doesn’t know if the Violator understood the rules. In this situation, the appropriate level of enforcement is in doubt. It is not unusual for people who are uncomfortable with verbal assertiveness to rely on body language as their primary method of boundary communication. The problem with body language is that it can be easily misinterperted or ignored. When a boundary violation ocurrs, many of these people keep repeating their body language in the hope it may work at some point. This is a classic example of Under-Communication. It is not uncommon for some of these people to become frustrated at repeatedly having their boundaries violated. This bottled frustration eventually leds to an emotional outburst of Over-Communication along with the associated Backlash. In many cases, it was the fear of a Backlash that caused the person to engage in Under-Communication in the first place. It was only their anger that switched them to Over-Communication. These individuals’ method of communication is emotion based. It is not guided by the goal of creating clear communication. Groups of people or sub-cultures can also engage in systematic Under-Communication. Typically, in places where there exists persistent and recurring social problems, there is also chronic Under-Communication. Colleges in the United States are examples of systemic Under-Communication in terms of sexual assault. The vast majority of students have never read their college’s policy on sexual assault. Many them do not know the legal definition of consent. Many students’ personal interactions are characterized by gray areas and communication inhibited by alcohol. Personal boundaries are broken and violated on a continious basis. The end result is sparce and inconsistent enforcement that creates both contempt for the rules in some cases, and a backlash against the rules in others. Effective enforcement is rare, and the problem of sexual assault continues year after year. Under-Communication can be best identified by it’s lack of effectiveness. If the level of communication used is not creating understanding, it needs to be changed to a higher level. When an effective level of communication has been achieved, the use of enforcement becomes less necessary. And when enforcement is required, it can be done with more conviction at an appropriate (Just-Right) level.